A couple of years ago, Mario Batali, Gwyneth Paltrow, Mark Bittman, and Claudia Bassols taped a 13-episode PBS show called “Spain… on the road again.” The show mostly entailed the four of them driving around Spain in Mercedes convertibles and eating incredible food. Batali and Paltrow published a cookbook based on the show which was the source of this recipe. Heat the oil in a large Dutch oven over medium heat. Add the fideos and cook – stirring constantly – until browned (about 10 minutes). Using a slotted spoon, remove the fideos to a bowl, leaving behind as much of the oil as possible. Add the onion, garlic, and pimenton to the oil and saute for about 5 minutes, stirring occasionally. Add the tomatoes and their juice, using your hands to crush them as you do so. Raise the heat to high and cook – stirring frequently – until the tomatoes have broken down and the sauce is thick. This should take about 15 minutes. In a separate pot, combine the stock, wine, bay leaf, and saffron. Bring to a boil, add seafood, cover, and cook for about 5 minutes (until the clams and mussels open and the shrimp is cooked). 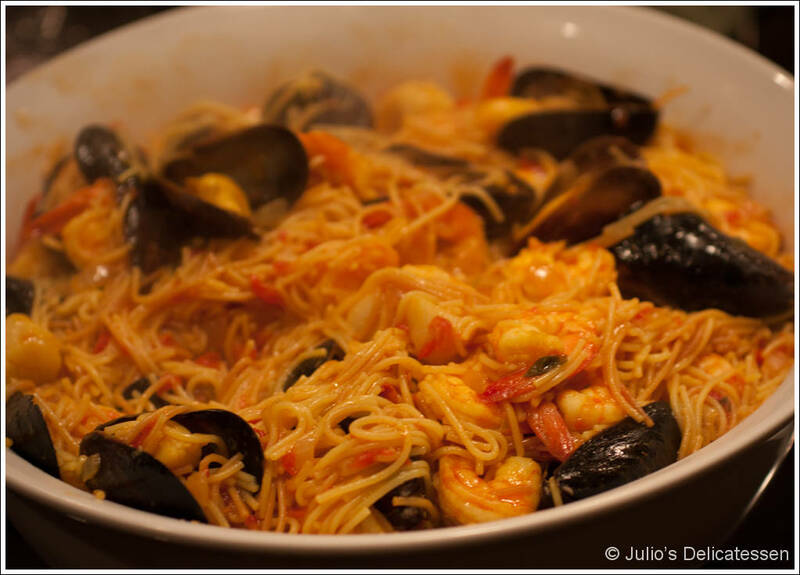 Transfer the seafood to a bowl and add the liquid and fideos to the tomatoes. Cook for about 15 minutes, stirring constantly. Add the seafood and simmer just until heated. I’m desparately interested in a sweet treat by Mario Batali from the book you used here. Since I don’t want to buy the whole book just for that one recipe, I wondered if you could help me out a bit. The dish is called “ensaimadas”. It’s a famous spanish yeasted dough-roll. Could you be so kind as to tell me the ingredients for that sweet treat he lists in his book? you’d really do me a favour! Нum êtes vous certain de ce que vous dites ?? Humm êtes vous certain de ce que vous dites ?